The Best of Hotels in Philadelphia Conveniently located within five miles of Center City, the Crowne Plaza Philadelphia - Cherry Hill hotel provides easy access to a wide range of local attractions. Visit historic sites like the Liberty Bell and Independence Hall or catch an Eagles game at Lincoln Financial Field. If youre looking for Philadelphia Convention Center hotels, Crowne Plaza is the ideal choice for any business traveler. We are just minutes away from the facility and other prominent businesses, such as Cooper River Park, Campbell Soup, Subaru and NFL Films. The Corner Cafe: The Corner Cafe proudly brews Lavazza coffee and fresh ground espresso and offers a variety of flavored coffees and beverages, as well as a light breakfast and lunch fare and snacks. The perfect place to grab and go! Embers Lounge: Offering a variety of bottle and draft beers as well as wines from all over the world. Burgers, wings, and other bar food is available too. 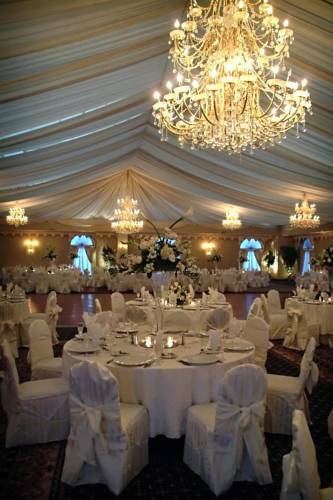 Grand Ballroom: With 43,000 sq ft of event space for up to 1,600 and services from a Crowne Meetings Director, this "Great Hotel, Guests Love" among the hotels in the Cherry Hill / Philadelphia area. Executive Boardroom 423: Audio Visual Equipment Rentals and Internet Access are available for an additional fee; Executive Boardroom with Large Conference Table, Leather Chairs, and private restroom. Cherry Hill MallThe first indoor shopping mall to open in the US! Large modern mall with numerous department stores including Nordstrom and Macys. They also have specialty stores such as Coach and Michael Kohrs. Philadelphia Museum of ArtAs one of the largest museums in the United States, the Philadelphia Museum of Art invites visitors from around the world to explore its renowned collections, acclaimed special exhibitions, and enriching programs. Franklin Institute of Science MuseumLocated in the heart of Philadelphia, The Franklin Institue is a leading museum in science and inovation. Interactive exhibits include "Space Command," "Sir Isaac's Loft: Where Art & Physics Collide," The Franklin Airshow, and the famous "Giant Heart." Liberty BellThe old cracked Bell still proclaims Liberty and Independence Hall echoes the words, "We the People." Call for hours of operation. Varies by season. Citizen's Bank ParkCitizens Bank Park is not your typical ballpark. Why? Because it's packed with so many fun, fan friendly features. With real grass, angled seating, rooftop bleachers and a state-of-the-art design, Citizens Bank Park is destined to be a true fan favorite. Adventure AquariumCome explore nearly 200,000 square feet of sharks, hippopotamuses, free-flying birds and sea life from around the world. Please call for days and hours of operation or visit us at www.adventureaquarium.com! Sahara Sam's Indoor WaterparkSahara Sam's is New Jersey's largest indoor waterpark with 58,000 square feet of splashtastic fun.